It’s early January, it’s the UK, it’s cold, it’s miserable – so what is there to think about in the cruising world to cheer us up? Well, since it’s January it must be world cruise time; and indeed this week sees a number of ships leaving Southampton, either on traditional ‘world cruises’ (i.e. a circumnavigation) or an equivalent-length ‘grand voyage’. Artemis led the pack, departing yesterday (4 January) on a 98-night Asian Grand Voyage – all the way to Tokyo and Xingang (the nearest port for beijing) and back – out through the Med and Suez Canal, round Asia, then to Japan, Korea and China, back through southern Asia, and then round Africa to return via the Atlantic. 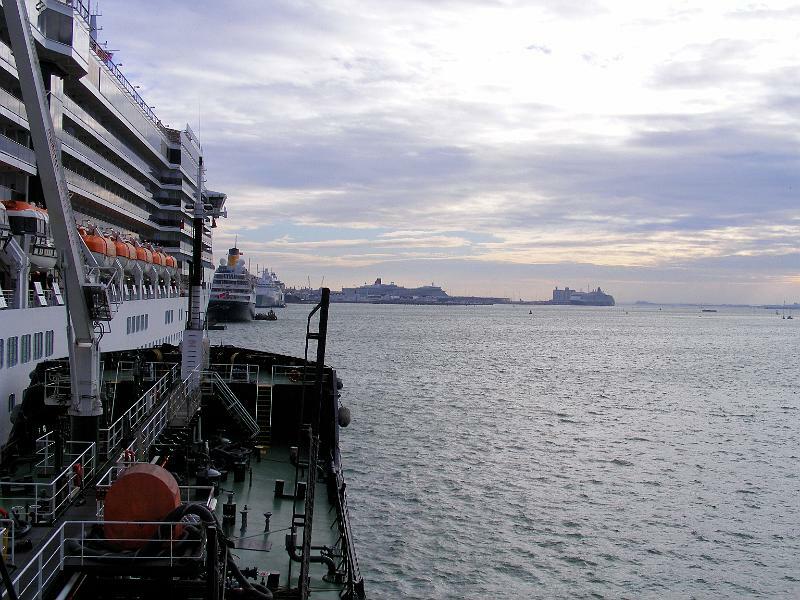 Today (5 January) is simply extraordinary – no less than four ships are leaving from Southampton today on world cruises or grand voyages. It must be hectic but exciting there. Arcadia starts an 82-night westwards circumnavigation – across the Atlantic to the Caribbean, through the Panama Canal and up the west coast to San Francisco, then south-west across the Pacific to Auckland; onwards to Australia where the ports of call include Sydney and Brisbane; northwards to Hong Kong; then generally westwards again towards Red Sea, the Suez Canal, the Med and finally home. Fred Olsen have two ships departing today, Balmoral and Black Watch. Balmoral, like Arcadia, is doing a westwards circumnavigation, but is taking 108 nights to complete it – there do seem to be more ports of call, and it could be that Balmoral’s cruising speed is a couple of knots slower than Arcadia’s. Next, Black Watch is doing what seems to be a very interesting grand voyage – 77 nights around South America. Heading first for the Canaries she then reaches the coast of Brazil and spends a leisurely time heading slowly southwards, with multi-day calls at Rio de Janeiro and Buenos Aires as well as other stops. Then round the Horn, after a slight detour to Port Stanley; up the west coast of South America, taking in the Chilean fjord country; then onto Peru and Ecuador, through the Panama Canal, a few calls in the Caribbean, and back across the Atlantic. That sounds like a terrific itinerary, and would in fact be my choice. The last of today’s departures is Cunard’s Queen Elizabeth. Like Arcadia and Balmoral she’s doing a westwards circumnavigation, lasting 103 nights. Inevitably there are similarities in the three itineraries; Queen Elizabeth’s takes in Hawaii before heading south to New Zealand, while in Australia she avoids Queensland. Possibly this is not a bad thing this year – I think it might be hard to enjoy the pleasures of the Gold Coast or Cairns, knowing that flood clearance work was still proceeding not too far away. Instead it’s straight to Sydney, followed by a voyage across the south of Australia with calls at Melbourne and Perth. From here it’s a typical voyage into Asia before heading for the Suez Canal, the Med and home. After today, there are departures by Aurora – she’s doing a 95-night South America and Pacific grand voyage, including not only Brazil, Argentina and Chile, but also New Zealand, Australia, and the northwards to the west coast of the USA before heading home through the Panama canal. She leaves on 9 January. Finally, Queen Mary 2 leaves on 13 January for a complicated 96 night grand voyage; too complicated to describe, in fact, other than to say that it starts in Southampton, finishes in New York, and visits six continents on the way. Would I want to do one of these (money allowing, of course)? Well, yes, but with reservations. Truthfully, I think I’d find the long passages in the Pacific tiresome, so I think I’m more drawn to the grand voyages, with frequent ports of call, than the circumnavigations. Arcadia’s circumnavigation seems especially sea-based: 82 nights, but only 25 ports. Allowing for two of them being multi-day visits, that’s just 27 days in port out of 82 – almost exactly two days at sea for every day in port. The Artemis grand voyage is a little bit better, but not much – 36 days in port out of 98 nights, so a bit under two sea days for each day in port. Of them all, it’s the Black Watch South American grand voyage that appeals the most: I count 36 days in port out out of 76 days for the whole cruise, so that’s close to a 1:1 ratio of sea days and days in port. That would suit me perfectly. Update: ‘Cruise Critic UK’ poster MattyBarlow has pointed that Cunard’s Queen Victoria is also in Southampton today, though not about to set out on a world cruise. That makes six ships in port on the same day (Saga Ruby is in port as well), which I believe is just about as many as Southampton can handle at the same time. Indeed, it’s probably only the fact that some of these are smaller ships that would allow six, I think: in summer, with larger ships such as Ventura, Azura, Independence of the Seas, Celebrity Eclipse and Queen Mary 2 around, I’d be surprised if six was possible. Matty also pointed me in the direction of the picture of the six ships that you can see at the top of this post. That’s Arcadia we’re alongside, then Saga Ruby, Black Watch, Balmoral (almost completely obscured by Black Watch), Queen Elizabeth sideways-on in he middle of the picture (she’s in the Ocean Dock), and then Queen Victoria away in the distance on the r/hand side of the picture.